In Oxfordshire we have been providing integrated care for patients with cardiac conditions for several years. It started with one psychologist from Oxford Health NHS Foundation Trust offering psychological assessment and treatment for an afternoon a week at the John Radcliffe Hospital at the request of the Lead Cardiology Advanced Nurse Practitioner. It soon became apparent the primary mental health problems for these patients were anxiety and depression and that the psychologist’s input was greatly valued by the cardiac nurses, patients and their carers. This inspired us to do more to make this accessible to patients across Oxfordshire. In 2012 we bid for funds to become a Department of Health Improving Access to Psychological Therapies Long-Term Conditions (IAPT-LTC) Pathfinder Site to evaluate an integrated stepped care model for patients with cardiac conditions and their carers. The model also involved providing clinical supervision and training to medical and nursing staff to be able to identify anxiety and depression and develop basic cognitive behavioural therapy (CBT) techniques. They in turn supported us to learn about the medical and rehabilitation aspects of cardiac care. This project ran for two years and demonstrated some significantly improved mental health outcomes and a reduction in health care costs – relating to A&E, inpatient and outpatient appointments – for those patients who received an evidence-based psychological treatment from the IAPT clinicians. We were delighted when the team was shortlisted for the Health Service Journal awards both in 2013 (Secondary Service Redesign) and 2015 (Value in Healthcare Delivery). 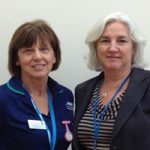 More recently, Oxford Health Foundation Trust IAPT service has become a wave 1 Early Implementer site for IAPT-LTC, and as part of this we are rolling out this model to patients with other long-term conditions including diabetes, chronic obstructive pulmonary disease (COPD) and chronic fatigue syndrome. I want to share our experience as it has been a fantastic opportunity for me personally, for our patients with long-term physical health problems, and their carers who all benefit greatly from this initiative. The physical health care teams we have spoken to are very motivated to develop joint working practices and pathways for these patients. The first task was recruitment. We had to recruit en masse if we were to get everyone in post in time to start their courses. We ran several assessment days to recruit our Psychological Wellbeing Practitioner (PWP) and High Intensity (HI) trainees in tandem with the university. The PWP trainee recruitment was particularly enjoyable, using an assessment centre format with exercises, presentations and role plays, with our trained PWP workforce and the university tutors scoring and giving feedback. Those people selected from the morning tasks went on to be interviewed. After more scoring and discussions we made our selection and offered PWP trainee places to seven enthusiastic, relieved and very happy candidates. During this time we also recruited eight HI trainees, some operational staff and clinical supervisors. The PWP and HI trainees all started on the same day. We decided to put them together for the first week of induction, partly because they shared some common induction tasks, but mostly so they could start to build team relationships and support each other. Staff are now well into the roles in the IAPT-LTC team and the trainees are progressing well. We have also received our LTC top-up training; 10 days for HI therapists and five days for PWPs for the qualified HI and PWP therapists who moved into the IAPT-LTC team to start seeing patients. The main task for the last few months has been to develop integrated pathways with our physical health colleagues so patients with long-term health conditions can receive medical and psychological care at the point of contact. Co-location and multidisciplinary team working means the IAPT-LTC workers are learning about the medical, surgical and pharmacological aspects of patient care at the same time our medical, nursing, physiotherapy, dietician and other colleagues are considering whether their patients with long-term conditions also have anxiety or depression. In addition to discussions about drug regimens and blood tests, these colleagues are considering with us whether their patients may benefit from CBT and other evidence-based talking therapies. It is still early days but feedback so far is that it is working really well for all. Dr Heather Salt (pictured on the right) is Consultant Clinical and Health Psychologist at Oxford Health NHS Foundation Trust and NHS England’s National Clinical Adviser for IAPT-LTC. Heather has worked for over 25 years in primary and secondary care services with patients with LTCs. She is accredited by the British Association of Behavioural and Cognitive Psychotherapies as a cognitive behavioural therapist, supervisor and trainer, and was the IAPT PWP course director and HI academic supervisor at the University of Reading for the first three years of the set-up and running of IAPT training courses. More recently, Heather has been leading the IAPT-LTC team in Oxfordshire which is a wave 1 Early Implementer site. Heather (right) is pictured with Marion Elliot, Cardiology Liaison Advanced Nurse Practitioner, Oxford University Hospitals Trust. I am keen to research the link between long term health conditions and mental health. Is there any chance we could arrange a meeting? I am working at Zinc (https://www.zinc.vc/about/), a startup incubator looking to make a positive impact in the mental health space.